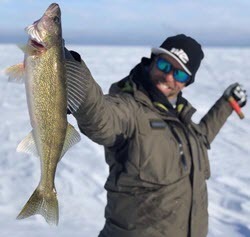 I was fishing earlier this winter — ice fishing actually — up on Mille Lacs, Minnesota when something struck me that I want to share with you. I may have talked a little about it before but it’s worth mentioning again. Fish are coldblooded, prehistoric creatures. They don’t know what a lure is supposed to do or why it was invented. They have no ability to think or reason. A fish will bite something because it looks like food or because they’re predators and they can’t help themselves. What they do is simple and straightforward, even if we don’t always understand it. So anyway, back to the Mille Lacs trip. We were supposed to be fishing for walleye and yellow perch. We caught plenty of them, too. But in the mix was a surprising number of bass — nice, healthy ones. The lure we used was a Rapala Jigging Rap Ice Jig. They come in five weights and sizes, and in at least 10 colors. Basically they look like a small minnow with flat sides. You tie them on through a loop on their back that’s in a place that allows them to hang perfectly horizontal when they’re in the water. They have one treble hook on the bottom just below the line tie and a single hook in front and another one in the back. To top all of that off they have a wide, flat plastic tail. They are a true engineering marvel. There’s nothing especially tough about fishing with them. Just drop them straight down below your boat and jig them up and down. If the water’s cold, go slow and easy up and even slower and easier going back down. When the water warms increase your speed accordingly. But do not, under any circumstances, rip them when you pull them up. These baits are designed to be jigged slowly. They are not blade baits. If you pull them up too fast, you’ll destroy their unique vibration. And, when you let them down do so on a semi-slack line, and watch it carefully. You want them to fall semi-freely so you get the benefit of their unique spiral, but you also want to be able to set the hook in an instant. Dropping them down properly is as much art as it is science. Most of your bites will come on the fall. The reason I’m talking about them now is because they are more than ice fishing lures, no matter what their name implies. They are dynamite baits when bass are suspended in schools. It doesn’t matter how deep they’re holding or how cold or warm the water is where you’re fishing. When you’re fishing one of the bigger and heavier Rapala Jigging Rap Ice Jigs I’d suggest a 7 foot, 6 inch Abu Garcia IKE Delay Series Casting Rod — medium action. 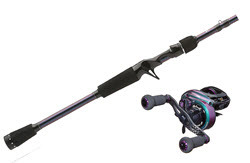 I pair it with a 6.6:1 Abu Garcia REVO IKE Casting Reel. 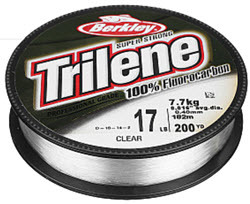 It’s spooled with straight 10, 12 or 15-pound-test Berkley Trilene 100% Fluorocarbon. With the smaller and lighter lures I drop down to a 7 foot Abu Garcia Ike Delay Series Casting Rod. I use the same reel but I lighten up my line to something between 8 and 12-pound-test. I always fish my Jigging Raps with straight fluorocarbon line. Never use a leader. You’ll get better action and catch more bass that way. Give a Rapala Jigging Rap Ice Jig a shot this summer when the bass school up offshore over deep water breaks. That’ll show them something they’ve never seen before, and just might put a few giants in your livewell.